Last February (2014) I was looking for something to do some winter driving, meaning snow covered roads & dirt trails. 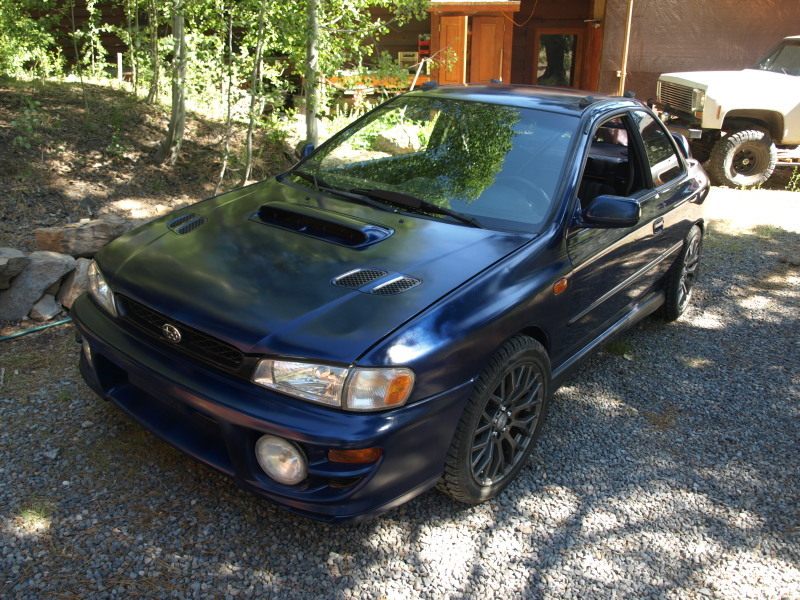 Something with 4 wheel drive – which points me to a Subaru or Audi A4. 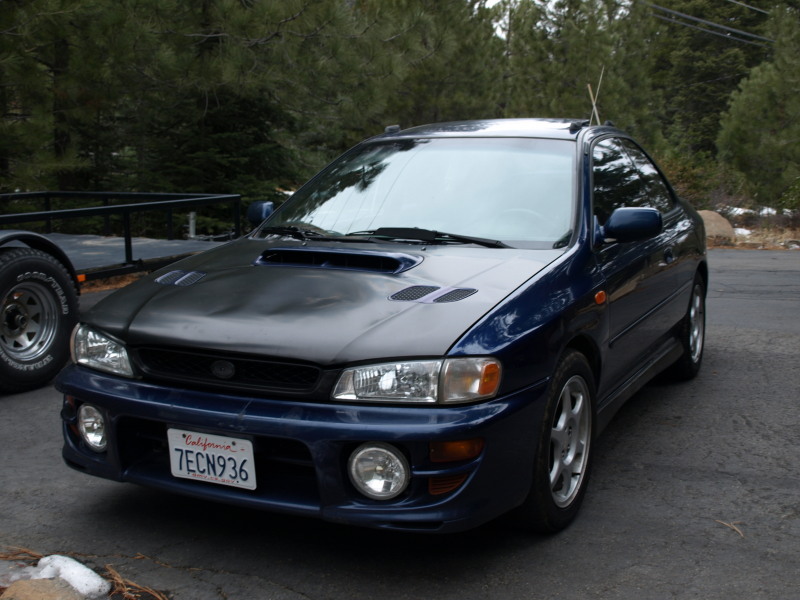 We bought a 2001 Subaru Impreza 2.5 RS for $3000. The good news is that the car body is in good shape, interior is almost perfect and its a 2 door coupe. The bad news is the engine is clapped out at 220k miles and the 4th gear pops out. Now (September 2014), the car is rebuilt & driving on dirt roads. Waiting for some snow. Well, putting those support straps lowered the light pattern, so I had to readjust the beams. The shake is cured, very steady lighting. Great visibility for off-road trails. On a separate topic, driving on a straight section of gravel road at 60mph in 3rd, then you hit the gas and get torque steer as the turbo kicks in. What a rush! 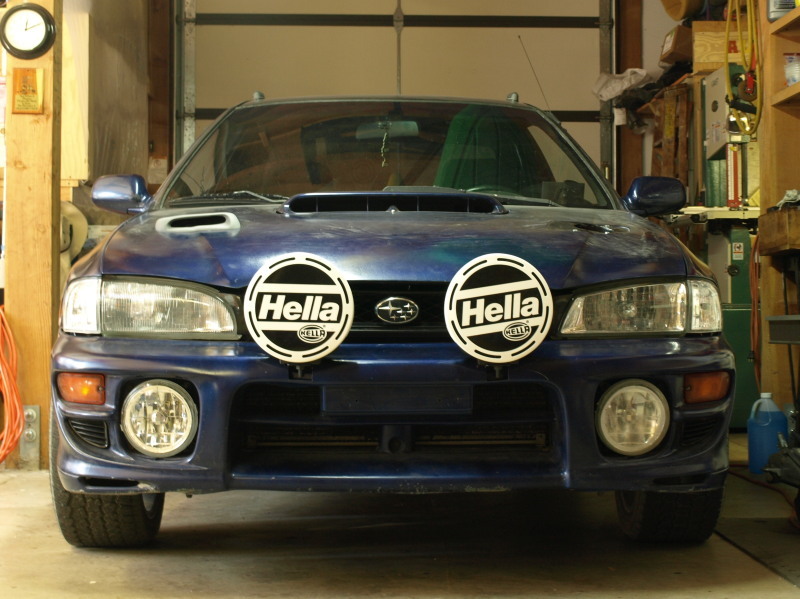 The standard headlights are not too bright, so I ordered a couple of Hella Rallye 4000 driving lamps . I had to cut out some of the front plastic bumper and bolted a couple of brackets to the underlying steel bumper. The lamps mounted on with a single bolt at the bottom of each. I installed a couple of Subaru relays (left over from the wiring harness merge) and a 20 amp fuse and wired this to a switch on the dashboard that tapped into the main beam signal. 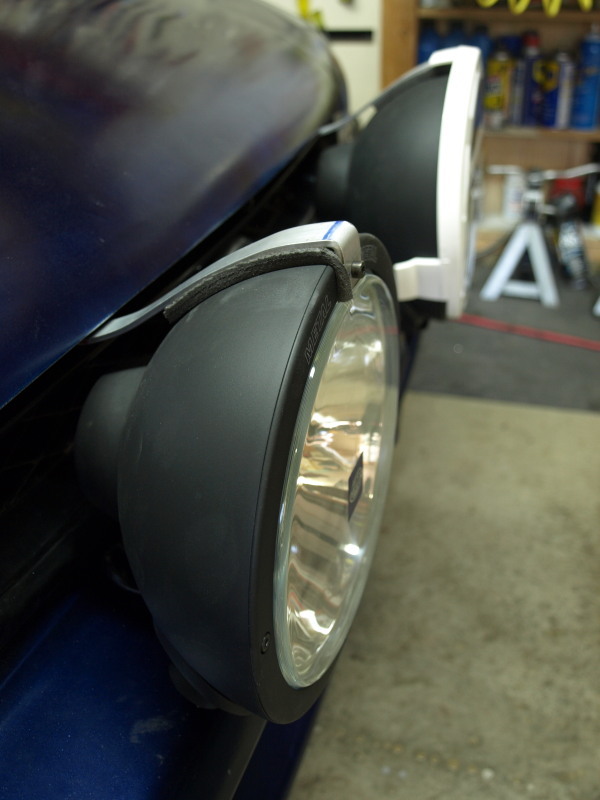 The headlights are active ground (the 12v is fed to the headlights at all times). So I wired the relays similarly. The actual spotlights are permanently connected to ground with an active 12v coming from the relays to turn them on. After fixing a couple of loose connections on the relay sockets, I had the lights working and waited until it got dark. I went on a test drive to Hobart Mills and found a remote section of road to align the spotlights. There are a couple of adjusters that use an Allen wrench. Then I set off to try them on the dirt road – they lit the road up really well – amajor improvement over the headlights. I noticed that the spotlights shake around quite a bit. Getting home, I made up a couple of aluminum support straps to the top of the spotlights to prevent the shake. I’m waiting for dark to try them out. Took the Scooby to Jared’s this evening for a tune up. Its done 900 miles since he did the initial set up. Initial finding on looking at the data was that the engine is running a little rich. Also the timing was a little advanced that the ECU was compensating. So Jared leaned out the mixture and retarded the timing. Now that we know the engine is good (after 900 miles), we can increase the max boost a little 15psi up to 17psi. Nothing drastic as we tune up in steps. 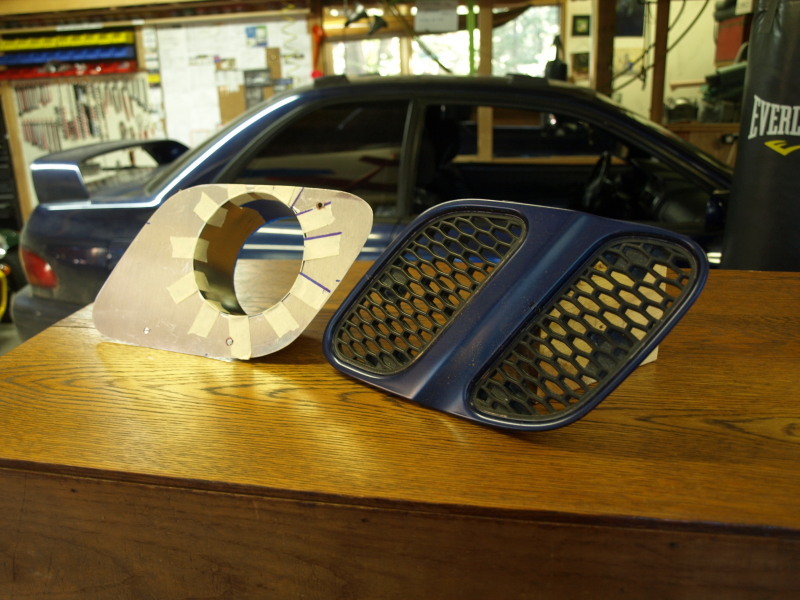 The air scoop simply pulled air into the engine compartment, but I wanted to force the air into the intercooler. See picture showing the scoop from above. I made a duct from angled aluminum extrusion, sheet aluminum with closed cell foam for the mating surfaces. 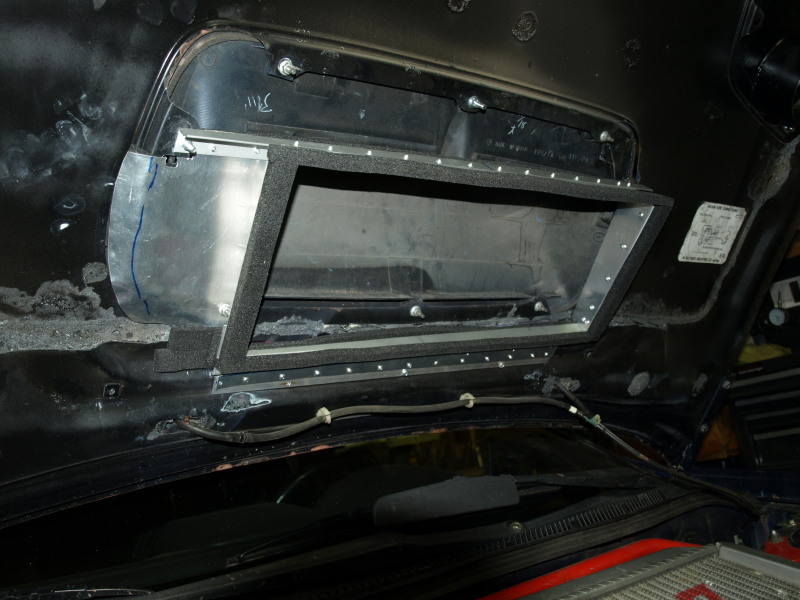 This is bolted onto the underside of the hood to align with the scoop. 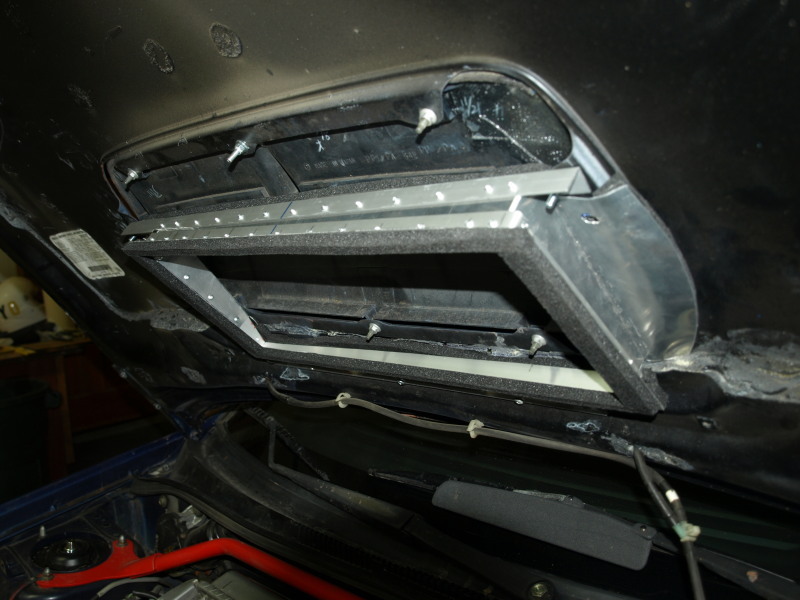 The lower surface has closed cell foam to mate with the intercooler when the hood is closed. 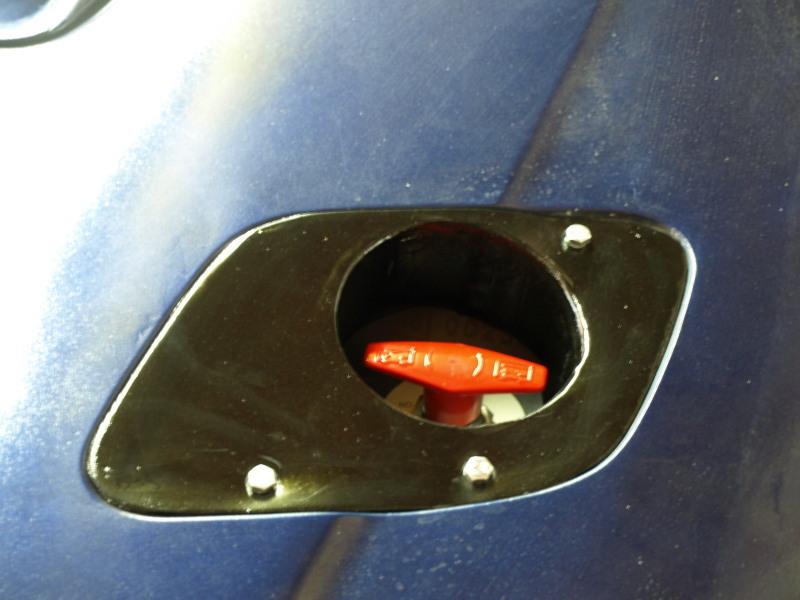 First off, here’s what it looked like with the mismatched opening to the engine bay. _______I made an aluminum plate that matched to the removed louvre, and cut a hole that would accommodate the switch. I inserted a tube of aluminum and held it all together with masking tape. Here’s what it looks like in position. Now, I had planned to get this welded together but I don’t have an aluminum welding set-up and Jared can only weld 1/4″ & up sizes (this is 0.025″ thick). So I had to go to plan B. This involved using fiberglass matt & epoxy to hold it all together. I used slow cure epoxy – that I previously used to build a kayak. This meant I had to wait 24 hours for the initial cure, enough to handle & trim. 2 or 3 cycles later it was done, then sanded and a coat of black paint. ________In it went and it looks OK. I had made a coolant hose connector out of 1.5″ brass tubing as a temporary fix until I could come up with a better solution. Well I found an in-line coolant drain at JEGS.com. I just had to modify the drain fitting for an ‘L’ barb fitting. It was a straight-forward swap and I feel better that the new one is not going to fail. The minor air con leak that I though was fixed, apparently was not. So, I installed the O-ring that was purchased a few weeks ago and re-charged the system. Lets see how long it lasts. Cruise control is not working and the ABS warning light stays on, indicating that its not working. I note that both of these items have their own controllers and have SSM wires going to the ODB II port. 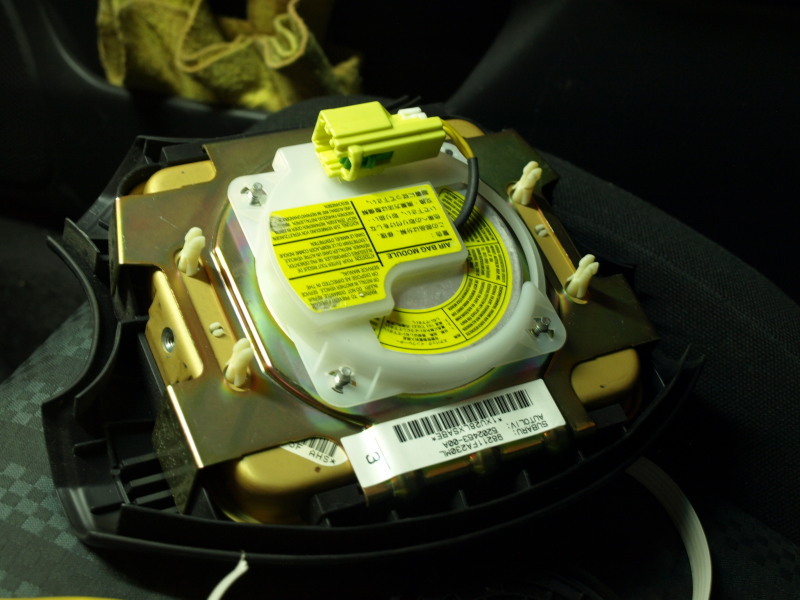 I also remember that they were also connected to the old ECU. 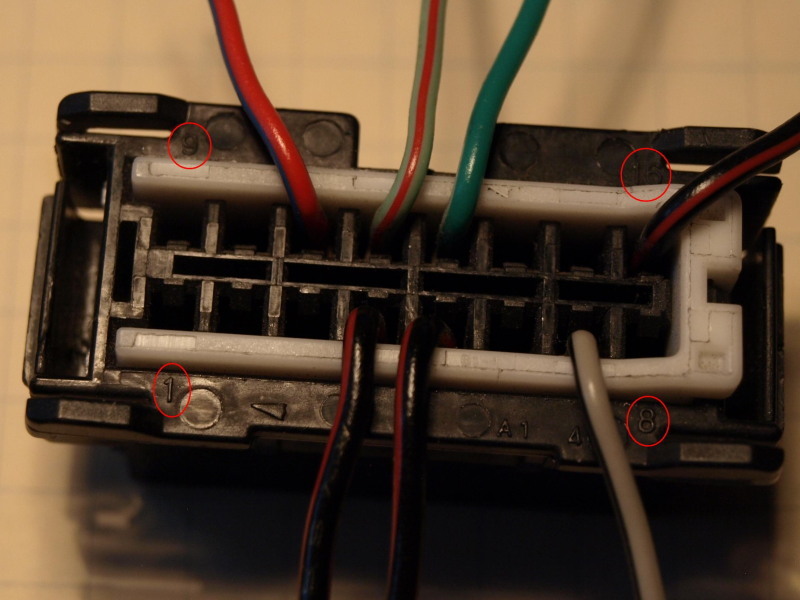 I also discovered that the Subaru schematics don’t have the correct pin designations for the ODB II connector. This can cause some confusion. 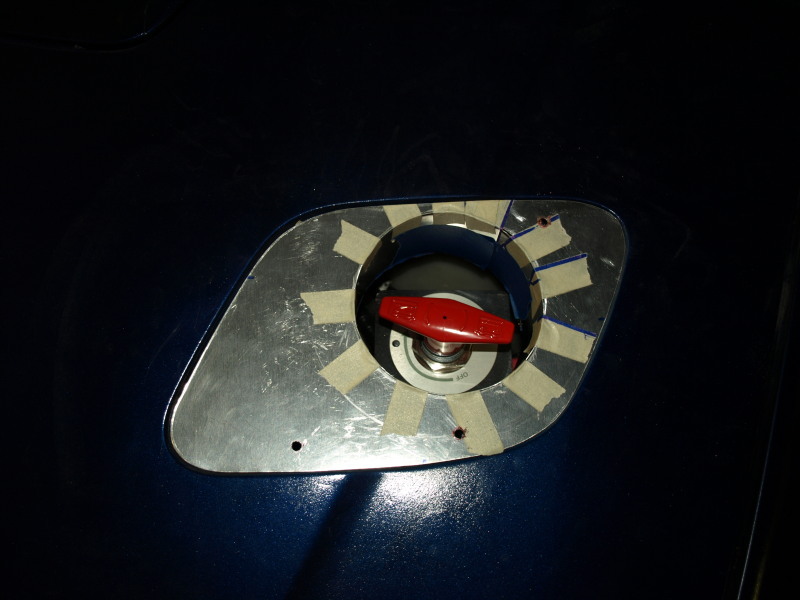 See picture of actual RS plug…. 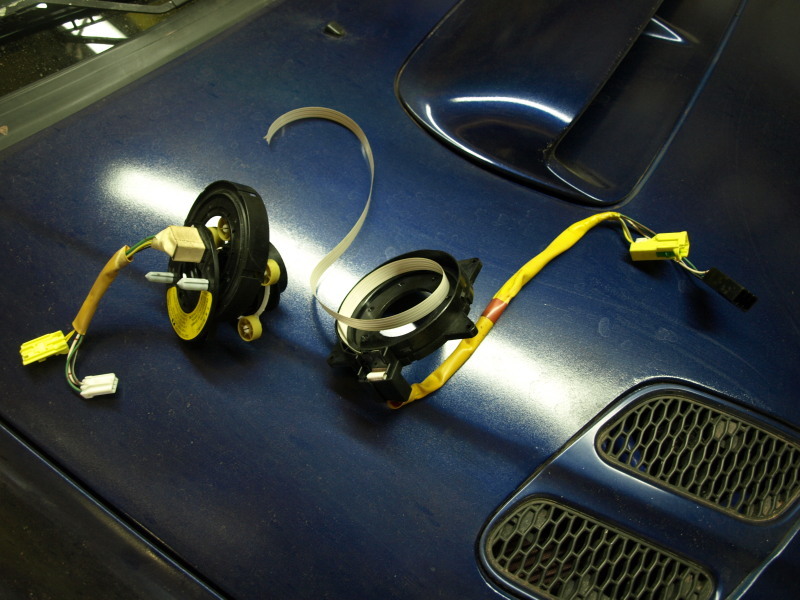 On my original RS2.5, pins 12&13 (subaru 4&5) were connected to the ABS & Cruise control with LgR & GW color wires – these wires also connected to ECU pins 135-12 & 135-11 (respectively). 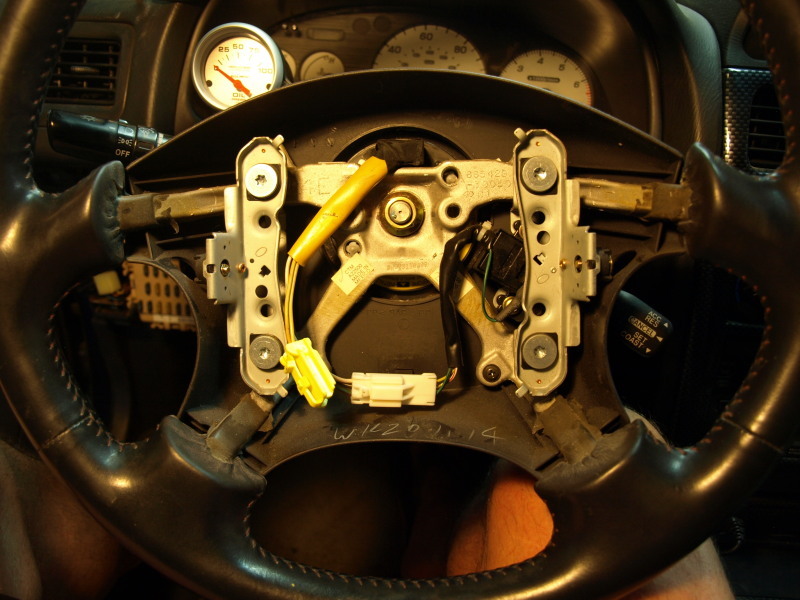 I tracked down the problem to the wiring harness connector inside the steering wheel. See the broken cable in the picture. I went to pick-n-pull and found a replacement for less than $10. Here’s some pictures of the replacement going in. 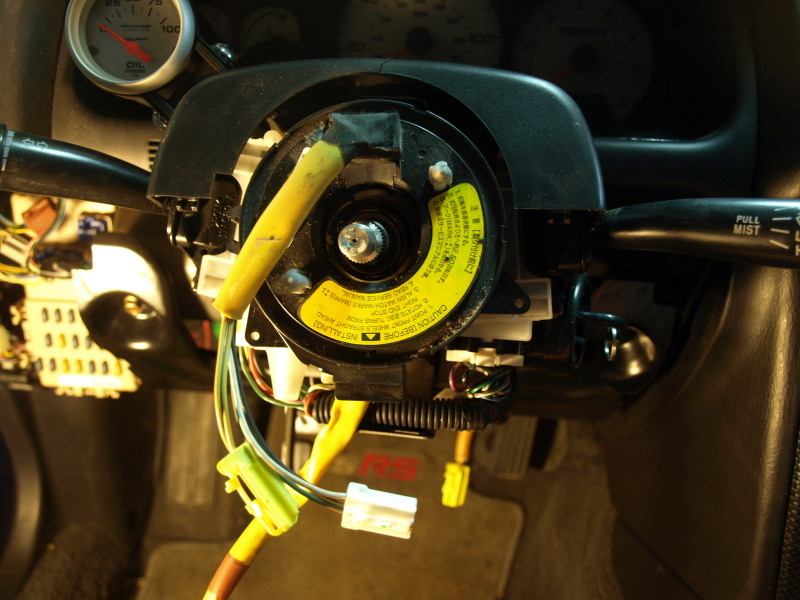 Air bag located inside steering wheel cover. 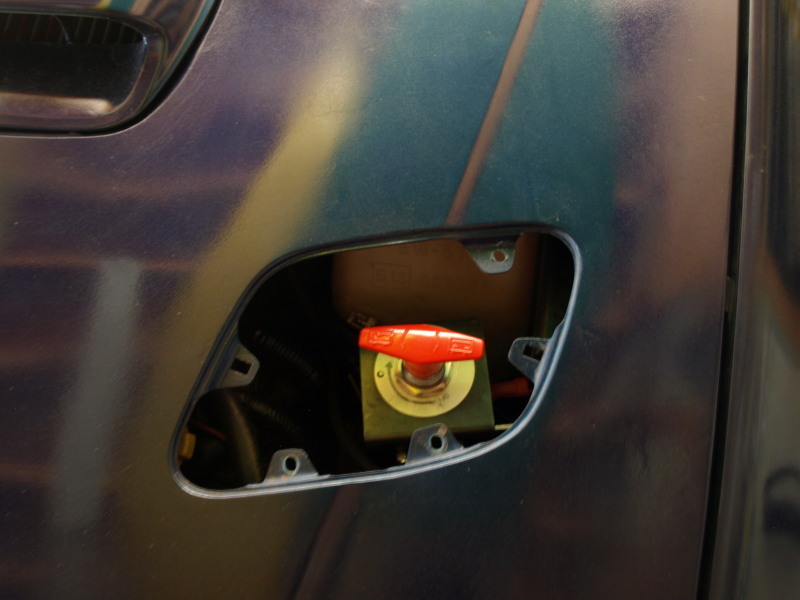 _____________As a result, the air-bag light is off and the horn works. The Cruise Control is still not working, so there’s something else going on there. Van Leuven Motorsport Specialities Performance tuning for Subaru & Audi.